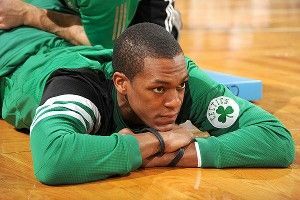 Despite recent trade rumors, Celtics coach Doc Rivers said he is confident that Rajon Rondo will remain with the team until the season’s end. “He can’t leave,” said Rivers, with a disturbing grin. “I’ve got his whole family held captive in my basement.” He then held a single finger to his lips, smiled broadly, and made a long “shhhh” sound. LeBron James scored 38 points and grabbed 11 boards as the Heat won their ninth straight, 107-93 over the Trail Blazers. The win came despite the fact that intellectual reserve forward Shane Battier, filling in for Chris Bosh, spent most of the second half reading Chaucer’s Canterbury Tales at halfcourt. Kevin Durant scored 38 points of his own as the Thunder roared back from a 14-point deficit to beat Orlando 105-102. The win came despite the fact that insane starting point guard Russell Westbrook played most of the game dressed up as The Pardoner from Chaucer’s Canterbury Tales. Surrounded by family, Red Sox catcher Jason Varitek wept as he announced his official retirement from baseball. Statisticians at the event noted that his tears only hit the floor at an average rate of .204, while the rest just sort of dribbled onto his shirt. The Philadelphia Eagles placed the franchise tag on receiver DeSean Jackson, leading him to tweet “Tough times don’t last!! But tough people do!” Reading the tweet from his couch, Eagles head coach Andy Reid sighed and whispered, “but they do, DeSean. Tough times just keep lasting.” He then removed the top bun from a Big Mac and drank the special sauce with a straw. Lamar Odom is nearly ready to return to the Mavericks, but will likely play at least a game with the D-League Texas Legends in preparation. Legends coach Davy Crockett was excited to have Odom on his team, but worried that there may be chemistry issues between he and point guard Pecos Bill. Another week draws to a close, and it’s time once again for the feature that brings a nation together: Participation Friday. Each week, I ask you, the reader, to submit your tales of triumph and tragedy. You’ve delivered big-time over the last couple months, and gained fame and notoriety along the way. This week, I’d like to take you back to the year 1998. Your humble narrator was a ninth-grade high school basketball player, a hard worker and a decent shooter just trying to help out his team. One frigid Adirondack morning in January, my team played a road game in a drafty gym. Our bus was late, so we barely had time to warm up, and when the game started my bones were still cold and goose bumps dotted my arms. Early in the first quarter, I got fouled driving to the basket. I shook out my arms and legs at the foul line, prepared, and shot: AIR BALL. A few laughs spread around the gym. The last time I had air-balled a foul shot was probably when I was three years old, but I told myself not to panic. “You’ll try to over-compensate this time,” I thought, “and you’ll shoot too hard. Just use the normal routine.” As I was about to shoot the second, I reminded myself not to give it too much juice. Result? A SECOND F*$%ING AIR BALL. The derisive chant bathed me in shame as I ran back down the court, wanting very much to run right out of the gym and bury my head in a snow bank. If you haven’t guessed already, this week I’m looking for your Most Embarrassing Sports Moment. Or a friend’s, or a stranger’s. If anybody wet their pants in public during a game, you’re almost guaranteed to make the list. Send your best stories to tobaccordblues@gmail.com, and the best ones will be run on Monday. Have a great weekend.